1) Which do you prefer, fire or water? please prove your point. you can use superhero analysis if you like. 3) What part of your physical features exposes you to the world? 4) If you were to die today, what would be your death wish? -May we not die today o! 5) If your house was on fire and you were only allowed to pick three things, what would they be? -iPad, Car Keys and a change of clothes. 6) Would you die for a cause you believe in? -If it’s a worthy cause, Yes. 7) Where else in the world do you want to be apart from your current location? 8) What music defines you? and why? -NONE! I’m a music hoe. 9)Do you still believe in Love? 10) Why do you blog? -I ask myself this sometimes and I think it’s because owning a WordPress is free. -It’s in the genes yo! 2. What do/did you study in the Uni? 3. Is CU the best school in the world? -Being able to share excerpts of my boring life with people. 6. Is there a special somebody in your life? 7. Why am I your favourite blogger? 8. Can Nigeria ever be great? -I used to think so, Right now, I’m not so sure. 10. What’s your selling point? -I don’t feel like bragging here. 11. How many questions did you answer truthfully? 1. Has your mother ever called you “mad”? -What an offbeat first question. 2. What one thing would you never buy if you had £1b in your account today? 3. Have you ever been to the east (of Nigeria)? -Does Port Harcourt count as east? 4. If yes, what’s it like there? Never been. -Answer my own question first. 5. Are you, today, who you hoped 5 years ago to be? -Not really, I’m meant to be rich. 6. Frank Spencer and Mr. Bean, Who’s worse/better? – Sorry, Who’s Frank Spencer? 7. What’s the oddest item you saw on sale while stuck in traffic? -I don’t get stuck in traffic much, I just go from Helipad to Helipad. Yannah? 9. Gay rights, yay or nay? 11. Are we done yet? 1. If you had all the money in the world but still had to have some kind of job, what would you choose to do? – Be a cake taster. 2. What do you believe stands between you and complete happiness? 3. What small thing could you do to make someone’s day better? 4. Is the country you live in really the best fit for you? -I also ask myself this question. .
-Don’t take people at face value. 6. Which activities make you lose track of time? -Stalking people on Instagram. It scares me. 7. What is important enough to go to war over? -Saying BBT is not funny. 8. What is the most desirable trait another person can possess? 9. What is the simplest truth you can express in words? 10. What are you proudest of in your life? -Right now, Passing my 2nd MB. Thanks for the ‘Re-nomination’ guys! Bless. Hey People + New Readers (I’ve been getting a whole lot of traffic lately; Heaven knows why). I’ve been really lazy/broke of late and I’m just here being useless to myself and to my immediate environment. I also just got off my bed not too long ago (16:45) to get water to have a bath and I met a pretty girl at the tap. She told me she had read my blog. This reminded me that I had past time after all. Well, you can’t blame me; I picked up scandal and I can’t become useful till I finish watching it. This has to be pretty soon because school officially starts on Thursday. On Thursday, I start junior clerkship which lasts for 48weeks with rotations in Medicine, Surgery, Paediatrics, Obs & Gynae, Anesthesia, Psychiatry, Radiology and Ophthalmology. Apparently it’s gonna be a looooonnnnnggggg 4th year. So much for ‘lounging’. I’m not sure what rotation I’m starting with because the time table isn’t out yet. Not like I’m anxious to start but God knows i’ll like to start with Obs & Gynae and get it over with. Shii is tough and I need the spirit of ‘initial gra gra’ to get through it. The next few weeks are posing to be long and difficult because they will most likely involve lectures, ward rounds, clinic sessions, grand rounds, theatre sessions, calls with associated tiredness to boot. P.s. I’m still torn between ending my education at the MB;BS level or pursuing a post graduate in Surgery or Obs & Gynae. Surgery has the upper hand already though. But what surgery exactly? I have no idea. Maybe I’ll specialize. Maybe I won’t. Maybe I’ll write countless research papers and become a Professor. Maybe I won’t. But, Prof. Kemi Windapo sounds good. Don’t you think? What aspect of Medicine do you think suits me? While I was away studying my life away, I got nominated for a Liebster! Yay! First Of All, Introduction I want to appreciate DankarO ShintO and Damilare for the nominations! You guys rock! 1. Food makes me happy. 2. 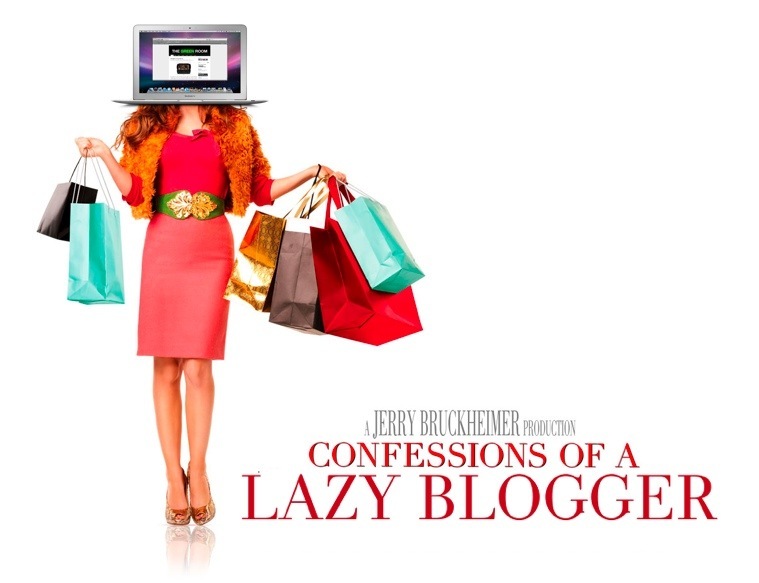 I’m the poster girl for Laziness. 3. I have ‘Result Jitters’ at the moment. 4. I love any kind of music. As long as it sounds good. 6. I’m currently reading ‘The Perks Of Being a Wallflower’ by Stephen Chbosky. ‘The Prince’ by Nicollo Machiavelli is the next on my list. 7. I look malnourished. At the moment. 8. I’m craving red velvet cake. 9. I have so much faith in my Mummy’s prayers. 11. I don’t wanna go there. Now, the hard part. Hard because I have to answer two sets of questions. 1. If you could only rescue one parent from a burning house which would you save, and why? Thank God both my parents can’t be found under the same roof. 2. How do spend your free time? Study, Eat, Sleep, Blog, Sleep, Eat, Sleep, Look for trouble. 4. If you were appointed President of your country, what would be your first act? Make the weekend last 5 days. 5. If you have to choose between dying by poisoning or suffocation, which will you prefer? What am I dying for Biko? 6. If you had just a wish, answer guaranteed what would you wish for? 8. What are the best five words that would describe you? Lazy, Fun, Silly, Smart, Single. 9. Which of the F.R.I.E.N.D.S character would date if you have the opportunity? 10. How did you get interested in writing? 11. If you could start all over in life, would you change anything? Most likely. Few things here and there. 1. Checkered blue and white’ or ‘black’? 2. Curtains or no curtains? No Curtains when PHCN do what they do best. 3. Hardcover, paperback or ebooks? I love paper backs but I can’t afford them. So ebooks for the win. 4. What’s your ambiance while writing? 5. Do you plan to publish a novel? 6. Do you like to make a gift for your loved one or do you rather buy? 7. Which is the most beautiful color according to you? 8. What’s your mantra in life? 9. Have you ever thought of becoming a soldier in your life? 10. Do you have stage fear? 11. ‘Mickey mouse/ Aladdin/Tom and Jerry’ or ‘Naruto/Bleach/Mega XLR? 1. Money, Power, Respect. Choose two. 5. What one word do you think describes me? Lol. This has been fun! NB: There is no general committee that handles this award. its’s just a recognition from one blogger to another for how awesome they are. Kind of like a really big internet hug. Merry Christmas people! Hope you’re gonna be having more fun than me; I’m gonna be home all day reading The Sicilian By Mario Puzo while munching on some home cooked meals. Christmas really isn’t what it used to be. Something I planned that ended up not being what I expected. That has to be my little humble blog. When I wrote my first post; #40thingsaboutme sometime in July of 2011, the response was overwhelming. I wasn’t genuinely expecting any responses when I was begging people to “Read, Comment and RT” but I did and you can imagine how overjoyed I was. I was not putting up spectacular things but I kept getting responses and page views. Thank you to all my readers that have stuck around for a really long time. God bless y’all. Hmm. Meaning of my blog name. My Blog name is Kemmiiii’s Blog. I know; I can’t be more obvious. 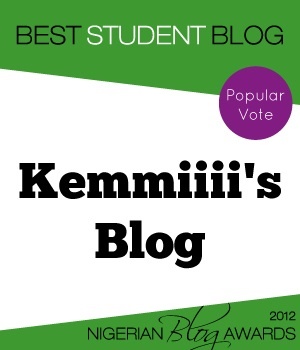 I am Kemi/Kemmiiii and this Is my blog. That’s logic. Why Kemmiiii with the double ‘m’ and four ‘i’s people always ask when I give them my blog link. Well, its because of the struggle to be cool. 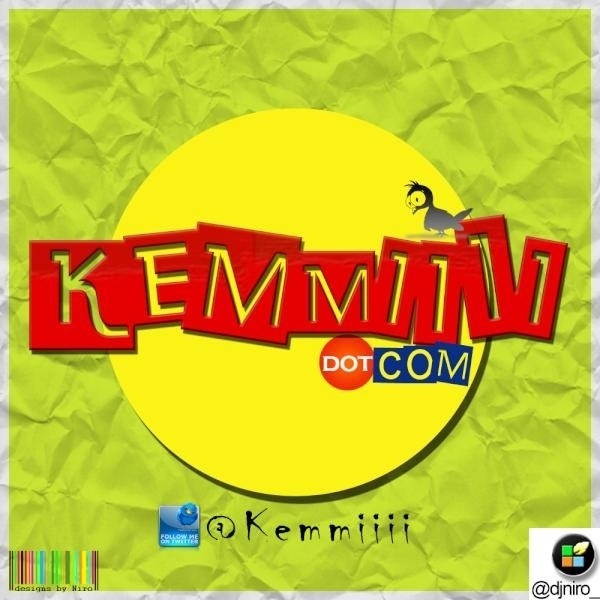 The ‘kemmiiii’ blog name stemmed from my twitter handle which was @Kemmiiii at the time I opened the blog. I go by @TheLazyMedic now; Kemmiiii was becoming too cliche. Anytime I meet people, they always go; ” O! Kemi with the so many ‘i’s”. Yeah. I don’t want any more of that. The struggle didn’t start from the @Kemmiiii handle tho. I started out as @Ojularioreodenu in 2009 because twitter told me @KemiWindapo was already taken and the two other Kemi Windapos in this world do not even go by Kemi Windapo. O ya mi l’enu. Anywho, When I started tweeting actively, @Ojularioreodenu seemed like a mouthful and too out of place so I tried out @KemiWindapo again and luckily for me, it was no longer taken. At a point, @KemiWindapo felt as if I was putting myself out there so i changed once again. @MsKemmii seemed cool because everybody had the Mr/Ms prefix so that lasted a while. Later, I felt; Which kain @MsKemmii? Let me just be @Kemi. But there was already an @Kemi who wasn’t even tweeting actively so I reported the account as spam but that didn’t cut it so I tried @Kemii, @Kemmii, @Kemmiii and so many other random combinations. I tried @Kemmiiii out of frustration. Alas! it was available! Success! So you see, My blog name has no meaning behind it; Just a really cool story. One morning, I felt as if the @TheNakedConvos handle was throwing subs at me. The person behind the handle obviously woke up to read a horribly written post or better-still; slept with one in mind. I begun felling guilty. I dunno why because I’m not on anybody’s payroll or something. Anywho, I have decided to cut the crap and take my blogging more seriously. I’ve started going around with my ‘blogging’ book to put down my every thought. As the handle advised. I’ve always been able to accept constructive criticism; Someone once told me that my punctuation was horrible, I took a look at my posts and agreed. I worked on it. My punctuation may not be a perfect 10 at the moment but its better. I believe in self help. I believe google is my friend. And we learn everyday so there’s no need to feel too big to take to corrections. No one is above mistakes that’s why we’re human. Lol. I was on a roll there. So I want to start by embarking on my 30 make that 40 day challenge (just because) which was the original reason I bought this ‘blogging book’. Since February 2012 o. I still haven’t gotten around to writing shingbain! Lazy ‘ol me. Asides that, everything I write; Good, bad, below par, awful, ‘uncompleteable’, will be posted. Nobody is awarding marks so heck yeah!